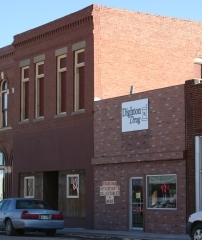 The Dighton Opera House is a two-story, L-shaped brick building located at the southwest corner of Long Street (Highway 96) and Lane Street in downtown Dighton. The building wraps around the state register-listed Old First National Bank, and together they form the largest and oldest block of buildings in the downtown. The property is significant for its reflection of local social and commercial history during the early 20th century, and was the primary setting for community events. 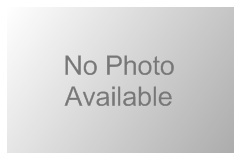 It is nominated for its associations with local social and commercial history. 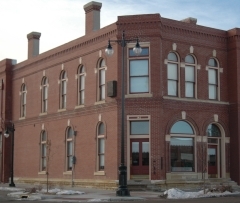 Situated within Dighton's commercial district, the Old First National Bank is a two-story, red brick commercial building originally constructed in 1889. By 1907, exterior alterations were done to mimic the new adjacent opera house, which included a new parapet and entrance. It functioned as a bank until 1950. 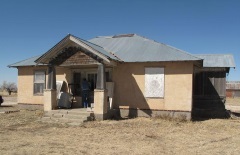 The property was nominated for its association to community development. Constructed in 1936 through the Federal Emergency Administration of Public Works (PWA), the Lane County Community High School is a two-story, blond brick building with a stone capped flat roof. Designed by Wichita architect Glen H. Thomas, the school exemplifies the Art Deco style. 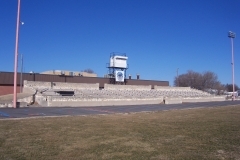 Also nominated is the 1938 athletic stadium constructed by the Works Project Administration (WPA). It includes a football field, quarter-mile track, and bleachers. Key features of the stadium include a short stone wall and limestone bleacher steps. The complex was nominated as part of the "Historic Public Schools of Kansas" multiple property nomination for its architecture and for its association with local education. Alexander and Anna Schwartz moved their young family from Russia to central Kansas by way of Galveston, Texas in 1906. They arrived during the Golden Age of Agriculture during a period when American farms grew in value and size across the country. They initially lived in Russell, where other family had settled, but soon established a farm in Rush County, where they remained until 1917 when they moved to a larger farm in Ness County. In 1928, Schwartz was approached about a land trade, which ultimately netted him more land in Lane Count suitable for grazing cattle. The Schwartz family erected a small farmhouse and various farm buildings - all made of structural hollow clay tile bricks - and they raised cattle and a variety of crops in the surrounding fields. The farmstead remains in the Schwartz family and includes the small Craftsman-style house, a smokehouse with a cellar, and a small gambrel-roof barn. It was nominated for its local agricultural significance.